Who needs to go to Baltimore for Hebrew school !? "When we enrolled our two girls in Hebrew school I thought that it would be a struggle. What 4 or 5 year old wants to spend Sunday morning in school? Well I am happy to say that my girls do! Both my girls wake up every Sunday eager to go to Chabad Hebrew school. Imagine ... a Hebrew School where kids don't want to miss a day. Imagine ... a Jewish experience where the children come in with a smile and leave humming a Hebrew song. Imagine ... a child who feels the warmth and spirit of Judaism. Imagine the pride of his or her parents. At Harford Chabad Hebrew School, you can hear the sounds of lively discussion, of singing, laughter and prayer. 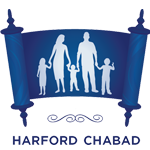 Welcome to Harford Chabad Hebrew School, an exciting and innovative educational program serving Bel Air, Abingdon, Forest Hill, Churchville, Fallston, Kingsville and the rest of Harford County. Our budding school enjoys a reputation of a fun, innovative and creative Jewish experience for children ages 2 to 13. Harford Chabad Hebrew School has exciting new programs, a dynamic staff and interested students. Our student body is made up of children from various backgrounds and affiliations. Synagogue membership is not required. Chabad Hebrew School teachers are carefully selected for their extensive knowledge of Judaism and their dedication to children. Each teacher lives and breathes what he or she teaches, providing the best possible model for our students. Staff members have education degrees, professional educational training and experience, Rabbinic ordination, and/or extensive Hebrew language skills. Through their education they have learned the strategies to successfully share Judaism with children of all levels of knowledge and ability. In addition, parents and volunteers assist the staff in various teaching, support and consulting roles. Your child deserves to have a fun and exciting Jewish experience. The Harford Chabad Hebrew School aims to assist you in providing that experience. Our mission is that the children graduate with deeply-rooted feelings of pride and affection for their heritage and for the holy G‑d given land of Israel. An area of particular emphasis is in the inculcation of Jewish values and ethics. Mutual tolerance and respect for fellow man are taught as basic principles of the Jewish faith. We believe that this can best be accomplished in an atmosphere of joy and warmth. Our approach is to stress the positive aspects of Judaism and its Mitzvot. Our children are put in touch with an identity that has persevered for thousands of years, an identity of beauty and deep significance. An identity which is inherently their own. Through creative tools and innovative methods this is Jewish education that the children will remember affectionately throughout their adult life. At the Harford Chabad Hebrew School, families of all backgrounds and affiliations feel comfortable and at home. For Curriculum, Dates, Testimonials etc. visit the about us page here.